Respected scholar Darrell Bock delivers in this volume on his topic of the theology of Luke and Acts. Mr. Bock, already hailed as having given us the best modern exegetical commentary on Luke, writes on a subject here he has given many years of his life to study. You will find all the usual suspects on the study of Luke and Acts–the connection of Luke and Acts, salvation, Christ, the Holy Spirit, women, and the poor. But there’s more. Things I hadn’t thought much of in regards to Luke and Acts, all laid out in a cogent, clear, persuasive form. As you would expect, he interacts much with other scholars and their opinions as he travels along his subject. As a pastor I can’t help but see some of that as the straitjacket the scholarly world has wrapped around itself. Still, he is concise enough that his text holds interest. If you are like me, you so think of Luke as one of the Gospels that you at times forget its special connection to Acts. Zondervan asked we reviewers to pick one chapter and particularly review it. I chose the one that I felt I had the least knowledge of–“The Law in Luke-Acts” (Chapter 18). It really didn’t seem to me Luke or Acts had a lot to say on that subject. Mr. Bock shows us that the scholarly world has had occasion to analyze the subject recently. He laid out the basics clearly in 3 paragraphs. I appreciate Mr. Bock fairly representing other viewpoints while telling his conclusion. In doing so he dodges the problem of becoming so immersed in details, as many do, that they forget a conclusion was why we went digging in the first place. I don’t have to agree to enjoy the evidence being weighed and a conclusion being drawn. He concludes that “… in the end law-abiding for Luke is only a consideration for Jewish believers, while Gentiles must be sensitive to certain practices tied to the law.” His idea seems to be “law-sensitive” is the orientation of Luke and Acts, and that it carries “realized promise” but no “salvation benefit.” Of course it has no salvation benefit, and I doubt Luke is really “conservative” in regards to the Law. More likely, to my mind, it’s Jewish person-sensitive since Christ has uprooted what has been deeply ingrained into the very fiber of their people. I’d say it’s more a sensitivity to the complications of a progressive revelation. He also masterfully discusses the issues of whether or not the Law failed, or at least how should what Jesus did be accounted for with the Law. He lays out all the possibilities available to form an opinion. I left it thinking that the Law failed in doing what people imagined it would while it fully succeeded in all the Lord planned for it to do. He traced things like Sabbath incidents and gave us the data that is needed to form our opinions. Mr. Bock succeeds because he gave me what I needed to decide for myself. And he did it well. The whole book delivers in this way. I suspect this book will be popular among scholars, students, and pastors. As for me, it will hold a prominent place on my shelves and will be the first volume I reach for on questions of Luke-Acts theology. What better recommendation could a pastor possibly give? Do you need encouraged? Inspired? This book delivers. Kristen Jane Anderson gives us her tragic story that becomes transformed by the Lord into triumph. A suicide attempt on a train track left her a double amputee. She should never have lived (that’s no exaggeration as the book proves), but she did. Listen to her story and finally see the hand of God become clear. I had never heard her story until my wife, a paraplegic herself, had been reading about Ms. Anderson and was fascinated by it. That intrigued me, but I began reading thinking I would decide for myself. I did and it was a page turner! When you read the advertisements that this book is a tool for suicide prevention, don’t assume that is all the book is about. Yes, every person contemplating suicide needs this book. Beyond that, though, every person fighting depression, or even a round of discouragement, will find this volume a rallying cry to not give up. Actually, if all you are looking for is a story of the mighty power of God on a life, grab this book. It reads easy and holds your attention throughout. What makes this book work? Ms. Anderson doesn’t hold back. No matter how unpleasant the detail, if it is needed to tell her story, she tells it. Depression, partying, all the things that added to the darkness she went through are given in all the gory details. At the same time, dark things are never glamorized. She tells us what she thought and felt each step of the way. Adjusting to her new found disability was shown in a clear way that as one who watched his wife adjust, I could relate. I thought that part was especially well done. Then, there was guilt. It haunted her through everything and we find where she found victory. Even with counseling and dealing with prescription drug issues we are let into her life. Failures, setbacks, and finally success are laid bare. The point where she found Christ was an emotional high in the book where you felt like cheering. Later, when her loving mother did the same, you find yourself excited again. Finally, there’s the lesson she learned–a loving God saved her on a train track so He could save her soul later. A lady with so much sadness became a lady filled with love and gratitude. Ms. Anderson, thank you for sharing your story that clearly can help so many. Here’s a treasure trove of wisdom from yesteryear. Written be William Penn and given as “Proverbs, Wisdom, and Principles For Better Living.” Yes, that is the William Penn of Pennsylvania fame. 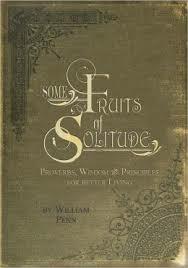 It’s not a book about solitude, but the wisdom he came up within periods of solitude. Perhaps we need more solitude if we could have as much insight as he did. The book is set up in categories like pride, luxury, frugality or bounty, right marriage, and many more. Yes, as you would expect, a category on friendship is included. This book can be taken in large or small chunks. I read several of these statements to my family and they spurred some good discussions. I would find my wife Alicia picking it up and reading it as well. Guess which one she found and loved the most? “Between a man and his wife nothing ought to rule but love. Authority is for children and servants: yet not without sweetness.” Strangely, that’s the very same one the publishers found best to put on the back cover. She and I both felt this book had good things to say to families. Our children need these forgotten truths. Older words are used at times and that may turn off some, but you can pretty easily understand the statements. Plus it has that classic look and feel to it. As I read it I so wished the people with influence in our country still viewed the world as Mr. Penn did. I say let’s bring back this type of common sense. There are some big things coming up for our family that are special for us and we want to share with you. Alicia and I are co-writing this together and she will be sharing it on her wonderful blog also. The first thing we want to share about is about our new vehicle. We have been driving a 2009 Toyota Sienna that we purchased not long after Alicia became paralyzed. It was an 8 passenger and so it held all of our 6 children and since it was a mini-van, it was low enough for her to learn to transfer into by herself. We have loved that van and it has never given us an ounce of trouble. However, the first year we had it was also the year that we were driving her to therapy 3 times a week (420 miles a week) and so we loaded it with miles. We were already over 86,000 miles and it was only 3 years old. 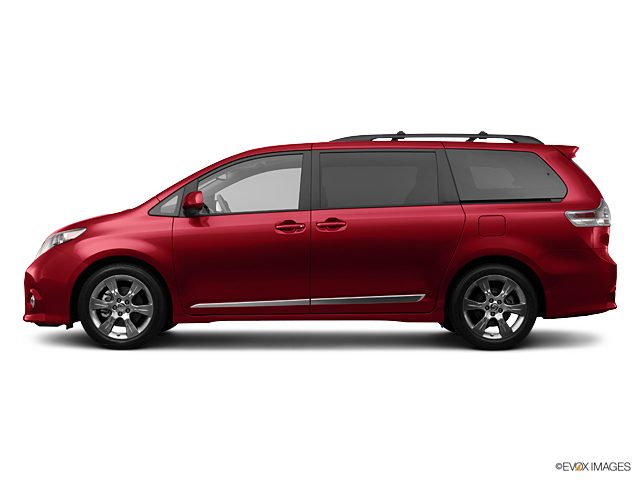 Toyota had a special 4th of July sale and we thought that if they would trade our vehicle and let us make the same exact payment we were already making, we could get a van that would get normal mileage for its age. We prayed and asked God that if this is what He wanted us to do, to make it happen and if not, we were fine with the van we already had and loved. God did make it happen and we now have our new van. We thank the Lord so much for that blessing for us! The second exciting thing is that at the end of July (July 30-August 3) we will be attending a Family Retreat hosted by Joni and Friends. This is a week of family camp for families that have special needs…..like us! We were asked to come as a family and lead the singing for the week. They are paying all expenses and we are so excited to be given this opportunity to work with other families just like us and to encourage them as they encourage us. Our children, especially, will receive such fun and encouragement this week and that means so much to us. Their lives have also been impacted and this camp deals with these things wonderfully. Please pray for us this week that God will bless and encourage all families in attendance and that He will use us to serve Him and others that week. Of course, the biggest news that you are well aware of if you know us at all, is the London Paralympics. We leave August 20th and will return September 4th. We are SO pumped about this! God has been putting things in place for us and we know it is His will that we go. We started a “Go Fund Me” page because several had asked for us to make a way that they could donate and be reminded so they could share with others. We are not big on asking for money but this is a great outreach opportunity and we know it is not possible for everyone to be able to go to London. By helping us get there, you are playing a huge part in getting the Gospel to disabled athletes. Alicia’s own wheelchair will already take away barriers so that they can hear our message. We cannot ask you enough for your prayers. It is a 9 hour flight to London and Alicia deals with extreme nerve pain after sitting in one place too long. So, please pray that God would help to alleviate some of that pain for the flight and if He chooses not to, that He will help her cope. I hate to see her in pain. And then of course, pray that God would use us. That is all we desire. We will be documenting what we are doing every day and keep you all updated. If you are willing to partner with us in prayer and/or funds, then we want keep you in the loop of what is going on to keep you involved as much as possible. We are soon going to open the doors of our home to you through a new Youtube video series that will highlight our life. We will keep it real so be prepared for bloopers, aggravations, a messy house and a lot of fun and adventure! We are excited to do this and hope you will enjoy learning what life is like in our home. Thank you so much for all of your love and support for our family. Alicia’s paralysis has added a very heavy layer to our home. Our marriage, our ministry, our family life…everything has been affected to a great degree. It has been through a lot of tears and much prayers, that God will just help us to learn and give Him the glory, that has sustained us. Your prayers for us have made all the difference in our lives and we don’t ever want you to think that we take that lightly. So, thank you from the bottom of our hearts for loving the Reagan family. Just how important is fatherhood anyway? Our culture has no answer as it can’t think of one good reason for fatherhood beyond the biological one. For that matter, many fathers can’t add any more items to the list. Shall we listen to our culture? I’m not sure what our listless age has to commend to itself to be our guide. God, as the Master Designer, is left out of our thinking and the consequences are horrific. That’s where one of the most incredible books on fathers I have ever read comes into play. “Father Hunger” by Douglas Wilson is profound and greatly impacted me. Every page was like the hard steel blades of the plow tilling through the soil of my heart. What Mr. Wilson was able to accomplish in this volume is rarely done. When the subtitle proclaims “Why God calls men to love and lead their families”, the book actually delivers on the “why.” Few books can give us the big picture and get especially practical as well. As an avid reader, it’s my opinion that most authors can give us only one or the other. Mr. Wilson, with verve, skill, and a pastoral heart actually pulls it off. He looks at our country and where it is today and sees the absent father as the biggest culprit for the mess we are in. From fathers who provide the seed for a child and vanish to the fathers who live at the same address and mostly do their own thing in life, we have a generation of absentee fathers. The Lord designed everyone to need a father. A father’s loving hand is needed in the life of every child. He says, “Your actual pursuits are a running scoreboard. They reveal what you actually prize.” Are you challenged here? I am. He shows how feminism, or the dire warnings of overpopulation, or the design of the welfare system, or the plea for gay marriage are all direct attacks on fatherhood. It also a direct attack on what every one of us needs to thrive as God intended. Statistics on everything from crime to education are given. The jury is in and the verdict says that homes without fathers are destroying children today. Without a Dad they will much more likely be a school dropout or be in prison. Also, the worst we see out of men comes from not encouraging them to settle down, accept responsibility, and protect their family. He shows how God is masculine (not male) and how masculinity (defined with care) is needed all around. There’s so much more, but this review is getting ridiculously long. For the practical side, the chapter “Some Father Mechanics” is worth the price of the book alone. I saw my lack all over its pages. Thank you Mr. Wilson. If no one else needed your book, I did.